As the nation churns toward the midterm elections, the Trump Administration has sent stark messages to voters about how they may wish to respond to Republicans’ unceasing attacks on health care and health insurance for the middle class and the poor. The failed campaign to repeal and replace the Affordable Care Act, aka Obamacare, and the follow on steps, administratively and as part of the $1.5 trillion tax bill that benefited rich corporations and the wealthiest Americans, likely will hit Virginia and Maryland residents hard if they’re seeking health coverage under the ACA. In Maryland, the two insurers selling individual insurance plans on the ACA marketplace are asking for an average rate increase of about 30 percent for 2019 coverage. That would amount to an average monthly premium of about $592 per member, compared with $449 per month in 2018. Nearly 212,000 people are insured in individual plans on and off the exchange in Maryland this year. Virginia insurers asked for a wide range of rate increases. CareFirst is seeking a 26.6 percent rate hike for its HMO plans in the state, and 64.3 percent for its PPO plans for the same reasons as its Maryland rate increase requests. Cigna Corp. filed for a 15 percent increase; Kaiser asked for a 32.1 percent increase for its individual plans; and Piedmont Community HealthCare requested an 18.3 percent rate increase. Some Virginia rate requests were lower. Anthem’s HealthKeepers subsidiary asked to increase 2019 rates for its on- and off-exchange plans by 5.6 percent on average, while Optima is seeking to lower rates by an average 1.9 percent. Last year, individual insurance rates went up about 30 percent over 2017 rates largely because of the pervasive uncertainty over the future of the exchanges as congressional Republicans worked to repeal and replace the ACA. The administration and Republicans have insisted the ACA is a failure, and costs too much. Though they have sought its repeal for eight years — and, indeed, throughout the critical first year of the Trump presidency — they have offered little in Obamacare’s stead. Independent, evidence-based analyses of GOP options like short-term and association plans find their cost advantages — the coverages can be cheaper for healthier, younger Americans — are undercut by their skimpy coverage. Consumers who choose these options, which the administration has even sought to foster in sneaked in provisions in the Farm Bill, likely will find little or no help from their health insurance at the very time they will need it. Meantime, as partisans rage about government spending and involvement in health care while sending the deficit soaring with tax cuts, President Trump has curtseyed to fiscal conservatives in his party by asking Congress for a “rescission” or reversal of $15 billion in the $1.3 trillion spending plan lawmakers recently approved. That’s 0.4 percent of total government spending this year, the Washington Post reported. But here’s the reason why Trump’s request infuriated his opponents and advocates for health care for poor youngsters: Half of the spending that the president made much do about eliminating will come out of just one program — the Children’s Health Insurance Program, aka CHIPs. That’s a program, a bipartisan creation with historic support from both sides of the aisles, that furnishes coverage to nearly 9 million children and 375,000 pregnant women. Beneficiaries are poor or working poor. Congress made the program a bargaining chip for more than a year, even beyond its reauthorization time, as lawmakers battled over the ACA, the budget, and a short-lived shut down of the federal government. A public outcry over the legislative shenanigans finally led to a plan to fund the program for a decade at relatively low cost compared to its benefits, many of them long term for children’s health and well-being. Trump officials have targeted the program anew, arguing it can sustain cuts without harm because CHIPs is set up so it holds money in “rainy day” accounts and to adjust for how its funding flow to states and how they expend the sums. Weary and wary, children’s advocates accuse the administration of showing its true colors and undoing difficult to achieve political compromises that had seemed to ensure CHIPs survival and success for the long term. In my practice, I see not only the significant harms that patients suffer while seeking medical services but also their huge struggles to access and afford safe, quality, and excellent medical care. Republicans certainly may hate on Obamacare, and, if they have the votes, they can get rid of it. Lawmakers also owe their constituents equal or better alternatives, so that health care isn’t an economic privilege but a fundamental right. It’s unacceptable to fork over more than $1 trillion to wealthy corporations and the rich while, at the same time, undercutting the poor and middle class. States are making some progress, albeit small, in their residents’ health — and this has been assisted with recent increases in the numbers of Americans with health insurance, coverage rates that have started to go the other way under the Trump Administration. Health coverage is but one part of a spectrum of issues that Americans must address, as we spend 18 percent of our Gross Domestic Product, more than $3 trillion, on health care that isn’t anywhere near the top in outcomes for western industrialized nations. Health insurance plays a crucial role in providing Americans with some greater financial security in the face of ever-rising and unacceptable medical costs. 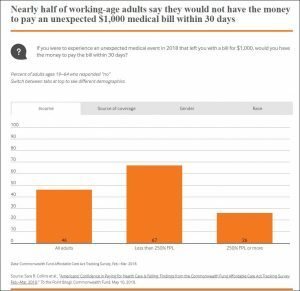 A quarter of Americans have expressed growing doubt that they can afford medical care, and half of those responding in a recent survey said they could not pay within a month an unexpected medical bill of $1,000. Health care has become a top and crucial issue for voters responding to other surveys. The president, his administration, and Republicans may want to heed the growing and intense public reaction to the attacks on the ACA, CHIPs, Medicare, Medicaid, and other health-related public support programs. We also need to remember and think about what we’ve seen out of partisans for some time now as we head to this fall’s elections to exercise our fundamental rights as voters.